Hello All! I know, I know, what in the world!? We're all supposed to be eating better this new year right? I think though with a few substitutions this could be super healthy! 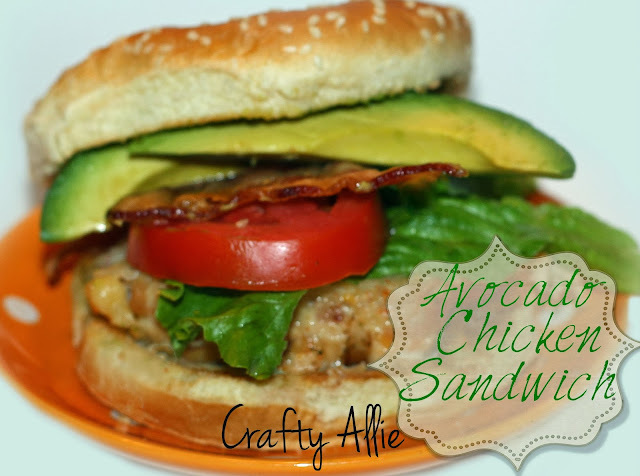 This Avocado Chicken Sandwich is a favorite around my house! Prepare your chicken however you choose. I love it best on the grill. But just last night I cooked it in the oven. If you do cook it in the oven, put a little olive oil on the breast to prevent them from drying out. I season my chicken breasts with Lawry's garlic and parsley salt. A little on the top and bottom of each breast. Cook the bacon or just buy the already cooked bacon. When your chicken breast are fully cooked, cut them in half and put a slice of cheddar cheese on top of it and let it melt. Butter your buns and season additionally with some more garlic salt, and then toast those in the oven. Add ranch dressing to your buns after they are toasted, then add your chicken, bacon, avocado slices, lettuce, and tomato. Now your gourmet sandwich is done! Make these for guest and they'll think you had take out delivered. Now if you're like me and need to shed a few pounds then you might want to substitute a few things. Less avocado, use turkey bacon, low fat ranch or yogurt ranch (which taste really good), and spray I can't believe its not butter instead of real butter or margarine, oh and low fat cheddar slices. This is one sandwich that you can still eat and watch your diet! I tried avocado for the first time recently and found that I really liked it! I will be trying this recipe for sure. Thanks for linking it up on Snickerdoodle Sunday! Thank you for bringing your yummy sandwich to Family Fun Friday! Wow!!! I love avacados on anything. Avacado and bacon make everything better! :) This looks super yummy! Thank you so much for linking up with Delicious Dish Tuesday this week! We'd love for you to link up to DDT again this week! Be sure to share our link so everyone else knows where to link up their awesome recipes too!